Evening all, bit short of time this week so it’s a brief one with mainly acts and figures, but I’m going to go back through that NY half start list over the next few days ( which is here) and do some check-backs to see how people performed vs expecations. So, stay tuned for updates. 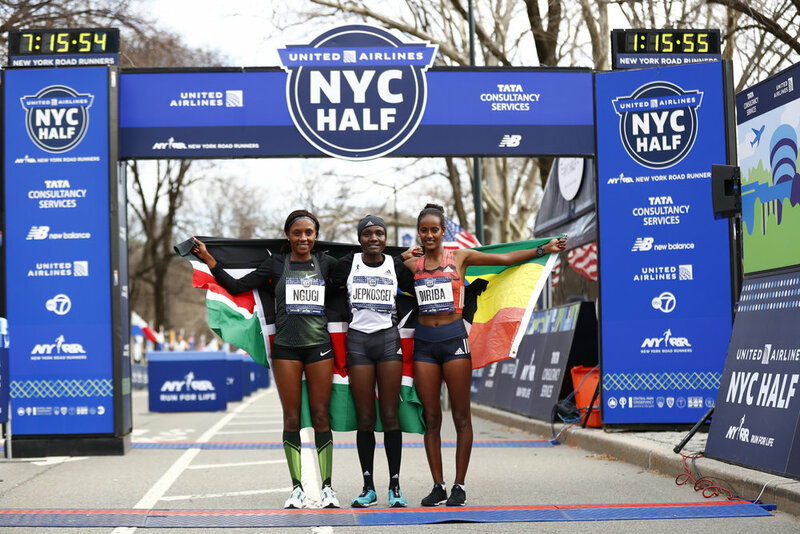 While a supposedly unknown runner won the men’s race (he didn’t have an elite start but he is know to be fast), the Women’s race was a bit of a shoo-in when you’ve got the half marathon world record holder in the field and a lot of the rest of the ladies in the middle of marathon training. Joyciline Jepkosgei of Kenya raced home in 1:10:07 (she set a pending world record of 1:04:51 in Prague in 2017, running WRs in the 10k, 15k and 20k as part of the race and set the official one in valencia… I think? It’s all a bit confusing.). Buze Diriba who was 1st last year in 1:12:23 was party to the more exciting part of the race when she and Mary Ngugi finished with the same clock time, though Mary pipped her to second place LetsRun.com reports that Kenyan Edna Kiplagat, Americans Emma Bates, Des Linden, and Kellyn Taylor maintained contact until the sixth mile. CIM 2018 winner Emma Bates held on and was first American home in 4th place and a PB of 1:11:13. Des Linden finished 9 seconds behind her on her way to defending her Boston title next month and Kellyn 8th in 1:12:43 . Also heading back to Boston, Sarah Sellers finished 13th in a PB of 1:14:05. Peurto Rican record holder, Beverly Ramos also had a good run, finishing just under 30s off her PB set in NY in 2016 on an easier course. In Lisbon, Vivian Cheruiyot obliterated the course record (1:08:22 set in 2015) , running 1:06:34 and on her own from 6 miles in. Cheruiyot ws pretty happy with that result and is chomping at the bit to run London next month. She’s ranked 3rd in the marathon so she has to count herself in with a chance. Joan Benoit Samuelson is going to run Boston reports Canadian Running. Jordan Hassay, who had to pull out of Boston last year, seems to be going well ahead of trying again this year. She won a St Patricks day 15k in Oregon in 51:34 which is 2:25:04 marathon pace. Running legend and Picky Bar owner Lauren Fleshman won the half marathon event in 1:21:44. I can’t wait to listen to the next episode of her Work, Play Love podcast (it’s WAAY better than the title implies) since her husband won the men’s race.